Five years of Senior Nomad travel has taken us to 80 countries and over 250 cities, but this last week we had our most complicated travel day ever. It would take twenty-two hours and five different modes of transportation to get us to our destination. Here’s how it played out. Several months ago we made plans to join our daughter Mary and her family for a week in July on the island of Sardinia. We had a vague idea of where we’d be at at the time, but regardless, we’d meet them on the appointed day and time - no problem. As it turned out, we were staying in picturesque village of Skradin in Croatia. We might as well have been on the moon. When Mr. Campbell, our Chief Travel Planner, began to look at our options it quickly became a head-scratcher. We were only 436 miles away from our meeting point as the crow flies, but it would take us 5 different modes of transportation and 22 hours to get there! We were in Croatia for a much-needed break after four months of fantastic travel through Asia. We’d started in Singapore and ended in Tokyo via Malaysia, Thailand, Cambodia, Vietnam, Hong Kong, Beijing, and as a finale spent three weeks covering Japan from one end to the other. We had some amazing experiences along the way, including an earthquake in Kyoto so we were more than ready for two weeks of sitting still aboard a 45' boat - except for the four nights we rocked the night away with the locals cheering Croatia on to the World Cup semi-finals. That was really fun - and Michael was adopted as a member of the Ladies Fan Club and given an honorary t-shirt. Croatia is one of the few countries we’ve revisited during our travels. We fell in love with it early on because of the natural beauty, the lovely people, and affordable lifestyle. In the past we’ve spent time in Dubrovnik, Split, Hvar, and Zadar. This time we found ourselves in Skradin, the main entry point for the famous Krka National Park with it’s stunning waterfalls and hiking trails. It was a part of the country we’d heard was a “must visit” but hard to reach unless you had a car - and, as you know by now, we rarely rent cars. But we found a comfortable Airbnb boat docked in a beautiful marina there, and since we do miss being on our boat, we were sold. So we made the effort to get there all the way from Tokyo via Moscow with a few days in Vienna before taking a scenic train ride over the Alps to Zagreb, the capital of Croatia for one night before taking two buses to Skradin. Whew! If you think that sounds complicated, just wait. 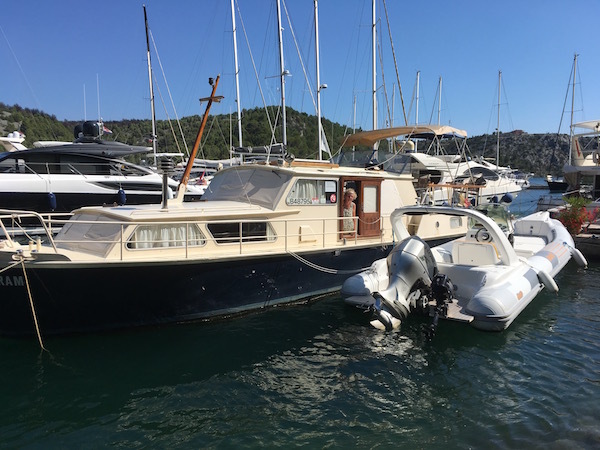 Our epic journey from the middle of Croatia to the northern corner of the island of Sardinia - maybe not the longest (that would be 36 hours from Paris to Auckland via New Delhi) we’ve ever taken but definitely the most convoluted. Michael relies on the app Rome2Rio for city-to-city travel guidance. It gives you options for modes of transportation including train, planes, buses and ferry boats where appropriate. It also provides comparative costs and a timeline. Between that, Skyscanner, Google Maps and our Lord, he found a way to get us from A to B. When he finally had a travel plan to share with me - I could tell from his solicitous approach that there was going to be some turbulence. It started by asking how I was, did I need anything - a drink perhaps? After a little shoulder rubbing and a reminder that we’ve certainly had a nice a rest, haven’t we, he laid it all out. First, we would need to get a ride from our hosts to the bus station in Skradin, which wasn’t much more than a shelter with a sort-of-bus-schedule taped to the wall. Hopefully, there really was a bus to Split leaving at 11:30 in the morning. That would be good since our entire trip to Sardinia hinged on that hour bus ride to catch another bus to the airport, to catch a plane to Rome, followed by two trains to the port town of Civitavecchia where we’d catch an overnight ferry! Alas, that first bus left a half an hour late and we were delayed by heavy traffic into Split. We scrambled to catch the next airport shuttle and arrived with barely an hour before our flight to Rome. We hate being rushed at the airport, and this was going to be tight. The Split airport is small, to begin with, and on that day it was over-crowded and chaotic. We finally got to our gate only to find our flight delayed by an hour. We were hungry, but the food at the one cafe had been devoured so we ate the few cookies and an apple I’d stuffed in our travel bag. Michael had softened the impact of this intense schedule with the enticement of a nice, romantic Italian dinner in Civitavecchia before we boarded our ferry. Now, not only was our flight delayed, it looked like dinner would be canceled altogether. Michael is always pulling our two 50-pound rolling bags behind him, as well as lifting them on and off platforms and up and down stairs. Meanwhile, we both carry day packs, a large purse and whatever else (this time a bag full of gifts for grandchildren). We are not nimble. So, after an agonizing hour in line at immigration, we had to sprint for 15 minutes to catch a train from the airport to the city center and then quickly find the connecting train to Civitavecchia, a small port town about an hour away. There we would board the overnight ferry. I was getting to the hairy edge of HANGRY at that point, which doesn’t make me a good travel partner, and now I was rushing through one of the largest airports in Italy to catch a train. What we didn’t catch was food. Not even a vending machine candy bar. But surely, there would be something to eat at the train station. Or at least there would be restaurants on the boat. We arrived at the train station at 9:30 pm two hours later than planned. It was smaller than we anticipated - as in two platforms, and we were the only people to get off the train. We found the exit along with a steep stairway down to the lower level and under the platform. Which we knew meant an equally long stairway going up. Should we just abandon our suitcases at this point? It seemed like a blissful release from baggage purgatory. Slowly we (mostly Michael) made our way up and out of the station. We saw a sign with a picture of a ship on it. That was good, we must be in the right place. But the station was deserted and the parking lot was empty. Even the Taxi Stand was abandoned. There were some lights on down the way, so we headed to towards a little cafe. Don’t think for a minute there was food ... they were already wiping down the tables and the last slice of tired pizza was snapped up before my eyes. We would have never made the boat in time without him. We were three miles away and the dock was deep inside a freight terminal. We had no idea what our ship would be like, but it turned out to be a massive car/truck ferry that was busy loading cargo and camper vans. Its ultimate destination was Barcelona - a 20-hour voyage! Our stop on Sardinia in the port city of Porto Torres, was about a third of the way. Most of the human cargo had driven on and then retired to small, private sleeping compartments. Being the frugal travelers we are, we spend just a little bit extra for two “sleeping chairs” for the 7-hour journey. We were used to sleeping on airplanes, so surely we could make this work. In fact, we were beginning to enjoy the adventure. We passed through security and located the walk-on passenger entrance of the ship where we found ourselves at the bottom of a set of stairways that seemed to stretch to the pearly gates. There was no way we could possibly get ourselves to deck Number 7 - where the sleeping chairs lie. 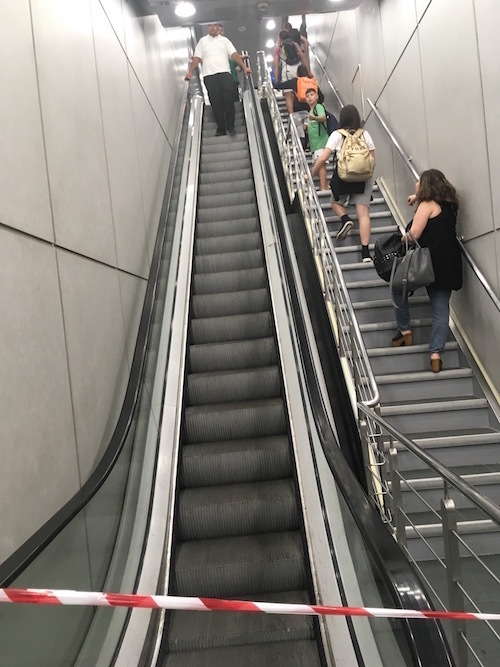 But, thankfully there were escalators. Except they were out of service. And apparently there wasn't an elevator. Baggage purgatory revisited. But once again, we were saved by angels. This time in the form of two young porters who looked at us, looked at our bags and shook their heads. There was no way these two bedraggled seniors where going anywhere without their devine intervention. They picked up our bags and began to huff and puff up the stairs. They dropped our bags, and we dropped ourselves in a large, dimly lit room the size of a small hotel ballroom. There were three rows of airline-style seats with two together on the left and right sides and a row of three in the middle. About 150 seats altogether. There were no windows and a code of silence. We stuffed our bags in the racks and settled in a row of middle seats with a seat between us. Michael was quickly dispatched to find food. Any food. He came back to report there was one serve-yourself cafeteria serving food that no matter how hungry we might be, looked inedible. And there was one over-lit bar serving drinks and panini. He left me with a can of Sprite and headed back for sandwiches. In the meantime, he enjoyed a beer with a new friend from Greece while he waited. Except for the beer and the conversation, It wasn’t worth it. The paninis were warm on the outside, and cold on the inside. Sort of how I was feeling at that point. The boat pulled away at midnight, so consistent with everything else, an hour late. Our Airbnb host had made the arrangements for a driver on the other side and there was no way to contact him until we landed, so hopefully he knew to wait. It was time to go to sleep. The room became very dark and most of the seats were draped with people sleeping across the seats, so arms and legs and heads poked out into the aisle-ways. If you had to make your way to the restroom or to get some air on the deck, you had to navigate carefully between body parts, which became tricky as we heading out to sea. We slept for about three hours all together. At 7:00 am we pulled into Porto Torres. There wasn’t much beyond a large parking lot where cars could roll off the boat and head off on holiday. For us walk-on passengers there was little in the way of direction as to where to go, and certainly no buses or a taxi queue. Luckily, we could see a lone car sitting in the parking lot, and (happy dance) it was our driver! We were finally on the last leg of our journey. About an hour later, we were sitting at a cafe in La Ciaccia, our final destination. We made it! We lingered over coffee and, yet another bad panini, while keeping an eye on the road until at last, Mary and Gregoire pulled up and our three youngest grandchildren piled out of their rental car and into our arms. Now, looking back, it was worth every single hour it took to get here.